CRISPR-Cas9 based technologies have revolutionized many areas of biological research since the discovery that the bacterial immune system could be re-engineered for use in gene editing. One such area is functional genomics—the use of up-to-genome-wide approaches to simultaneously assess large numbers of genes for a role in a particular phenotype. 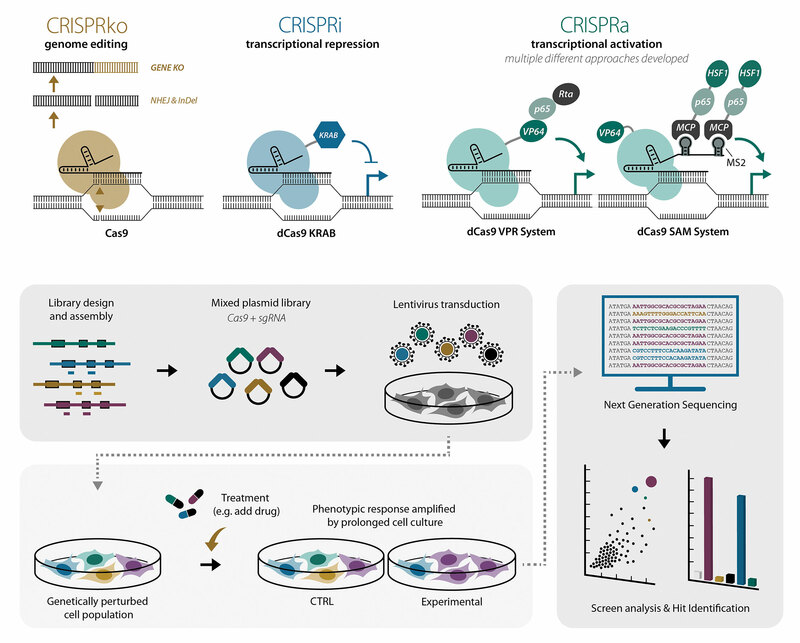 In addition to gene knock-out (ko) studies, novel CRISPR platforms, CRISPRi (interference) and CRISPRa (activation), can now also be used to down- or up-regulate endogenous gene expression, respectively, to explore areas of biology inaccessible to CRISPRko. CRISPRi and CRISPRa technologies allow the user to control transcription using modified forms of Cas9 (Figure 1). In both cases, the catalytically deactivated Cas9 (dCas9), no longer able to cut DNA, is linked to factors that mediate the blocking (interference) or activation of transcription. The modified dCas9 is targeted to the promoter region or transcriptional start site upstream of selected genes using target-specific guide RNAs (gRNAs). For CRISPRi, the presence of dCas9 upstream of the coding region can sterically block transcription factors and RNA polymerase. The dCas9 is fused to other transcriptional repressors, such as KRAB, that stabilize the complex on the genomic DNA. This loss-of-function approach is complementary to the CRISPRko method, but also enables the study of essential genes and amplified loci, which can be problematic to study using CRISPRko due to the off-target effects caused by the simultaneous induction of multiple double-strand breaks. CRISPRa is unique in its ability to study gain-of-function perturbations using endogenous gene targets. There are several approaches that can be used to modify dCas9 to drive transcriptional activation (Figure 1). The most effective gene-activation systems are VPR (where dCas9 is fused to a complex of three transcriptional activators: —VP64, p65, and Rta), and synergistic activation mediator (SAM; —where the gRNA is modified to include an additional sequence that enables it to recruit both dCas9 and transcriptional activators). Pooling libraries of gRNAs to generate populations of cells each carrying a different target-specific perturbation enables simultaneous screening of multiple genes for a phenotype of interest. The pooled gRNA library approach can be used with CRISPRi, CRISPRa, and/or CRISPRko, which can be combined to enable dual loss-of-function and gain-of-function screening. Following selection for a desired phenotype in a population of cells, the genes mediating that phenotype can be identified using deep sequencing to reveal which gRNAs are present in the selected population (Figure 1). Large-scale libraries, covering up to the whole genome, can provide the maximal window for phenotypic effect and high statistical power for hit discovery. Figure 1. Principles of CRISPRko, CRISPRi, and CRISPRa in whole-genome screens. 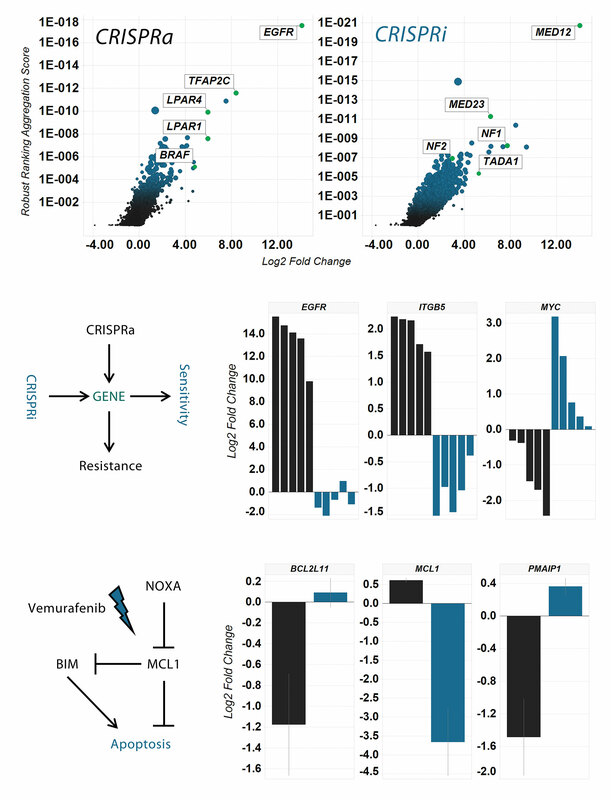 Horizon Discovery scientists carried out a proof-of-concept dual screen, combining loss-of-function and gain-of-function data, to determine the mechanism of action of the anticancer drug vemurafenib (Figure 2). The team hypothesized that transcriptional modulation with CRISPRa and CRISPRi would allow a subset of cells in the population to become resistant, or display increased sensitivity, to vemurafenib treatment as a result of altered gene transcription. These cells would be detected by their increased or decreased gRNA abundance in the cell population, respectively. CRISPRi screening yielded a series of previously validated and novel vemurafenib-resistance hits, demonstrating the quality and precision of this screening technology. 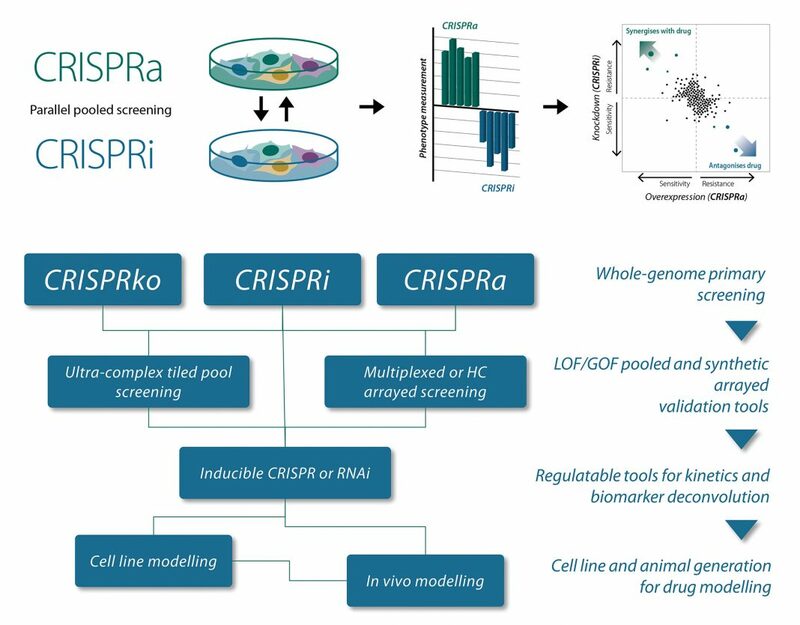 A number of novel hits found in the CRISPRi screen were not detected when using CRISPRko, due to their high degree of essentiality, supporting the value of CRISPRi in finding hits that could be missed with CRISPRko screening. In the CRISPRa screen, vemurafenib resistance was primarily conferred by an increased activation of genes involved in pathways that bypass BRAF kinase inhibition, in accordance with the established model that vemurafenib is a BRAF inhibitor. 1. Assuming that a gene drives resistance to vemurafenib following a loss-of-function screen, when you look in the opposite direction with a gain-of-function screen, this same gene can confer the opposite phenotype (i.e., sensitivity to the drug). 2. In the second scenario, a different gene might behave in the opposite fashion. Activating this gene with CRISPRa causes resistance, whereas down regulation with CRISPRi results in sensitivity (Figure 2). With these concepts in mind, the combined datasets were searched to identify genes with switch-like phenotypes. The opposing effects caused by gene down regulation (CRISPRi) or up regulation (CRISPRa) are clearly seen with MYC, which sensitizes cells to vemurafenib in the CRISPRa screen, yet resists treatment in CRISPRi, while ITGB5 and EGFR, behave in the opposite manner (Figure 2). In addition to providing a strategy for the validation of drug-resistance targets, dual screening also allows for the identification of pathway modulators that affect both drug sensitivity and resistance, but in which gRNAs are not reciprocally lost or increased. This was particularly evident when the triggers to apoptosis on vemurafenib and the controlling components MCL1, BIM, and NOXA were examined (Figure 2). These results clearly demonstrate the value of carrying out dual screens in parallel to unpick complex gene-interaction networks. Figure 2. Results from a dual screen investigating pathways affected by the anticancer drug vemurafenib. As powerful as pooled screening is, there remains a need for arrayed functional genomic screening for high-content datasets, such as an enzymatic function analysis. These datasets give a complex, high-resolution readout, for which pooled screening is inaccessible. Horizon Discovery has generated synthetic CRISPRa reagent libraries for arrayed screening using the VPR system, including synthetic CRISPR RNAs and lentiviral gRNAs, to enable dual CRISPRko and CRISPRa screens to be carried out in arrayed formats, for experiments where pooled screening is not possible. The CRISPR platforms discussed allow for a more complete functional genomic screening workflow, with the end result being a much deeper, more informative dataset than was previously attainable. In addition to cell survivability readouts, the dual-screen approach can also be combined with flow cytometry to assess phenotypes unrelated to proliferation. Fluorescent reporters or antibody labeling can be used to sort cell populations using high-throughput flow cytometry. Differentiated populations displaying phenotypes of interest can then be sequenced independently to identify gRNAs as before. Datasets can undergo secondary screening in pooled experiments or may alternatively be used in better targeted array experiments. Inducible tools can be valuable to help understand temporal resolution and/or the effect of additional biomarkers. These discoveries can then be modeled into a cell line or animal model for best representation (Figure 3). The novel dual CRISPRi and CRISPRa screening platforms substantially broaden the range of possible studies, through their capacity to reduce or increase, rather than completely eliminate, gene expression. Taking each screen independently provides valuable functional genomic information, but only by combining the datasets is a more complete discovery opportunity realized. As such, dual screening is the new gold-standard in drug–gene interaction screening, providing deeper insight into the biological effects of down- and up regulating genes in parallel in the same experimental model. With new CRISPR screening platforms available, picking the right one for the job is crucial for research success. By providing comprehensive CRISPR-Cas9 screening services, from screen design and cell line selection to sophisticated bioinformatics analysis of the screen results, companies such as Horizon Discovery are offering researchers an unparalleled resource for the characterization of genes and their role in disease biology and drug responses. Figure 3. Hypothetical dual screening experimental results and subsequent workflow possibilities. Benedict C. S. Cross, Ph.D. (benedict.cross@horizondiscovery.com), is the head of functional genomics at Horizon Discovery. The results presented in this article were provided by the Horizon Discovery R&D group.